My website is developed using WordPress. On my website’s home page, I have a section ‘What’s New’ to show the latest two projects I have been working on. I do this by making the last two added portfolio posts sticky. To complete the design I’ve used the Mosaic jQuery plugin to display these two Sticky Posts. This blog post show a step-by-step how to integrate the Mosaic jQuery plugin with WordPress Sticky posts. Download the Mosaic jQuery plugin from Build Internet! by One Mighty Roar. WordPress is packaged with the jQuery library. You need to add jQuery with WordPress using your theme’s function.php file and register/enqueue any new scripts accordingly. Make sure to read Dear theme developers, this is how you add scripts in WordPress themes. This tutorial will show you how to load scripts in a WordPress theme the right way! Part of the web design, I’ve decided beforehand about a specific size I want the images to be, that display in the Sticky Posts. This is different to the image size I use in the actual post. To accomplish this, I set up my own custom thumbnail size for the Sticky posts. The image for the Sticky post will be added by setting it as a Featured Image in the new post admin. Open the function.php file in your WordPress theme and add the following. In this example the custom loop for the sticky posts go in the custom home page template for my WordPress website. It can be used in any page template. After creating the custom loop in the custom page template (in this case my home page), it is ready to add the following code after the first line of the loop. After adding your new WordPress post, go to Featured Image, to set the image that will be used in the Sticky Post. 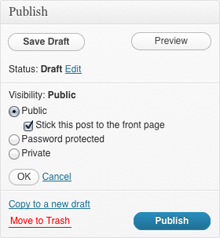 This can be found in the right column towards the bottom of the post editor in your WordPress admin area. Add the new image by setting an uploaded image as Featured Image. To display Custom Fields in you WordPress admin area, click on the Screen Options tab at the top of the screen and tick Custom Fields. Add a heading and a short description for your Sticky Post via the Custom Fields that will now display underneath the new post text area. After the initial set up of the Custom Fields in the custom loop, use the same names to add the new Custom Fields. In this case it is Feature Title for the heading and Feature Teaser for the description. Last but not least, make the post sticky! This can be enabled and disabled on any posts any time after a new post has been published. You can find the tick box in the Publish panel on the right of the new post’s admin area under Visibility: Public. See image on the right. Thanks for this, it’s very handy. Interestingly though, I think you might have some issues with the custom page template code : (Step 3.) It’s using characters that need to be represented in UTF-8. If you just drop the code straight into your template as is, you’ll get an internal server error. Do you know a way around using a symbol like that? Thanks Sam, that is a very valid point. Can be confusing for people that don’t know the code should all be in one line. I’ve change the code to rather stay in one line and have the option for a horizontal scroll where necessary.